Junco Partners - Ready Steady Gone! 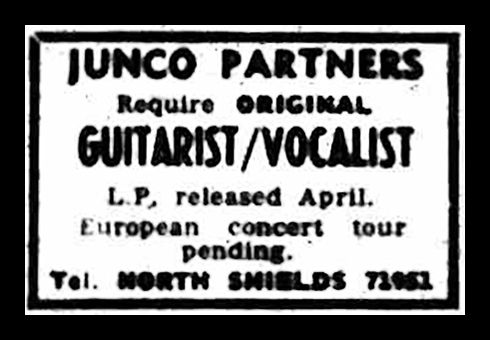 Newcastle’s Junco Partners must be one of a small number of bands that performed for over 50 years whilst retaining most of its founding members. Amazingly, when the Junco Partners played its final gig in 2017 four of its original 1964 member were still in the band. The length of time that the guys were together speaks volumes about friendship and the respect they had for each other’s musical abilities. The first time I saw the Juncos was in March 1965 at the Blue Note club in Sunderland. At the time I ‘d been playing in my first proper band, the Kylastrons, for about a month and had seen quite a few bands at the Blue Note. But nothing I’d seen up to then could compare with the show the Junco Partners put on that night. Their performance had such an impact on me that I still have vivid memories of it five decades later. The club was full and by the time the band started the atmosphere in the Blue Note was electric. The band was tight with a superb solid rhythm section and individually the musicians were brilliant. It was mesmerising to watch the two vocalists – John Anderson and Ronnie Barker dancing from side to side and clapping their hands in unison. Overall, it was an exciting performance and the band lived up to all the great things I had heard about them. Later that year and two bands on, I saw the Juncos for a second time. 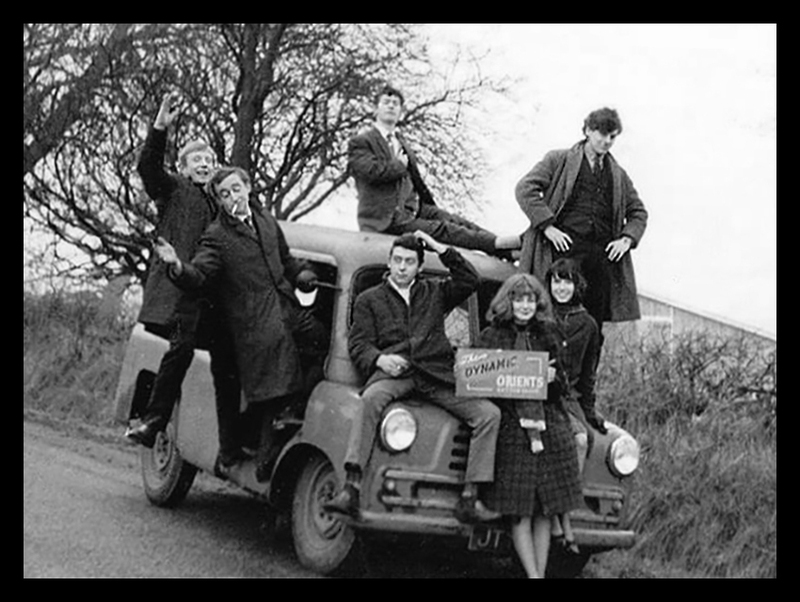 I was playing with the Sunderland based Jazzboard and in December 1965 we appeared at the Sunderland Art College Ball at Seaburn Hall on the same bill as John McCoy’s Crawdaddies and the Junco Partners. The Juncos were just as enthralling as they had been at the Blue Note when I’d seen them earlier in the year. Towards the end of the night there was an impromptu jam session involving some members of the Juncos and the Crawdaddies, including the two sax players from the Crawdaddies, plus me. I can’t recollect exactly what songs we played but playing alongside some of the Juncos made it a great experience. I seem to recall Ronnie Barker collapsing in a drunken stupor before the end of the session but that’s rock ‘n’ roll for you! Between 1966 and 1970 I saw the Juncos many times and often played on the same bill as them at the Mayfair, first as a member of the Jazzboard and then Sneeze. Over these years the Juncos line up gradually changed and, in my opinion, with every change a little bit of the magic I had seen in 1965 was lost. That’s not to say that the music had deteriorated in any way – it hadn’t. If anything, the band sounded better and more polished than before. While other local bands were changing repertoires to keep up with current musical tastes, often not that successfully, the Juncos were, by and large, still playing a lot of the blues material they had been performing since 1964. Throughout the mid to late sixties they were still well respected by local musicians and considered to be one of the best bands in the area. However, whereas in 1964 and 1965 there had been an overwhelming expectation that they would achieve national success, by the late sixties it was apparent that the Juncos chances of fame and fortune on the same scale as the Animals were diminishing. Junco Partners evolved from a Lobley Hill based band called the ‘Nevadas’ (formerly the ‘Orients’). In 1964 the Nevadas’ band members were Dave Sproat (bass) and John Woods (drums) who would both go on to become the formidable Juncos’ rhythm section, Ronnie Barker (vocals), George Firman (lead guitar) and Ian Campo (rhythm guitar). Dave, John and Ronnie were all from Newcastle whereas the other two members plus the band’s manager lived in Lobley Hill, Gateshead. The change of name from the Nevadas to Junco Partners came about when the band members were looking for an identity that would reflect their transformation from a pop group to a Rhythm & Blues outfit. One of the albums they were listening to at the time had a track called ‘The Junco Partner’ by James Booker. The band chose this title for the band, dropping ‘the’ and adding an ‘s’ at the end. In the summer of 1964 the Juncos went for an audition at the Club A’Gogo, the Newcastle club owned by The Animals’ manager, Mike Jeffery. 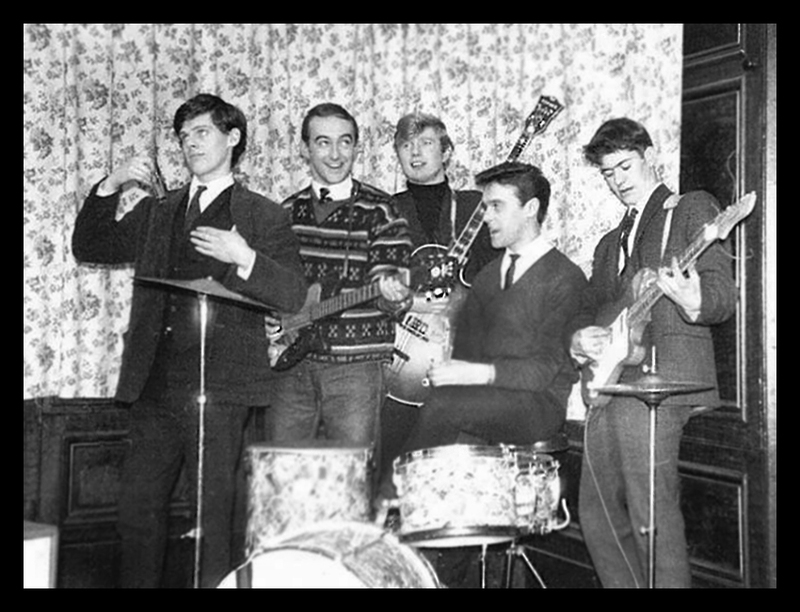 Six months earlier, under Mike Jeffery’s wing, The Animals had left Newcastle and had become a successful international recording band. Mike Jeffery believed the Junco Partners had promise and perhaps thought that at some stage they could follow in the footsteps of The Animals and earn him a lot of money. However, he had reservations about the two guitarists and told the others that they would have to go. Over the next few weeks Dave, John and Ronnie brought in some Newcastle musicians they knew to replace George Firman and Ian Campo. They were – seventeen year-old guitarist Charlie Harcourt, organist Pete Wallis and a second vocalist, John Anderson. Mike Jeffery allowed the band to rehearse in the Jazz Lounge of the Club A’Gogo on the nights that it wasn’t open to the public, normally Monday, Tuesday and Wednesday. In the meantime, The Animals had achieved an international hit with their version of ‘House Of The Rising Son’. 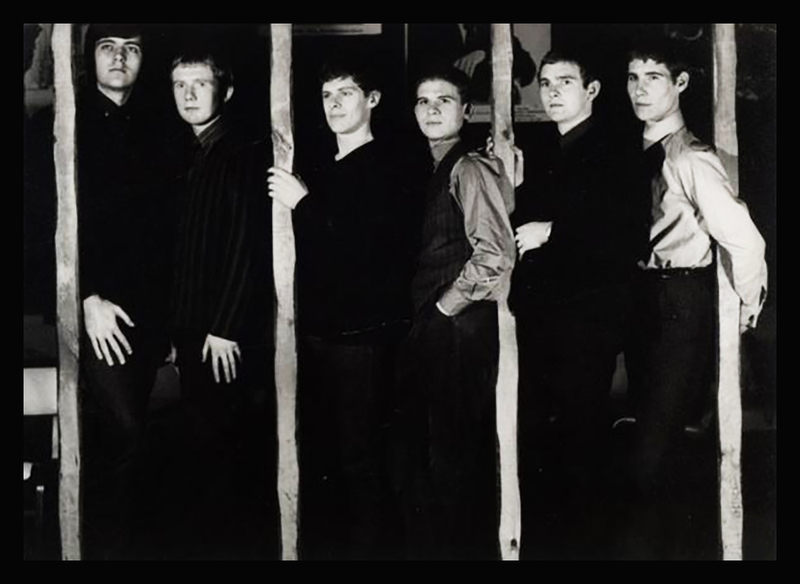 About to embark on their first US tour in September 1964, The Animals were at the Club A’Gogo one evening in the summer for a party hosted by Mike Jeffery. The same evening the Junco Partners, unaware of what was happening, turned up at the Gogo for one of their regular rehearsals. The Juncos were surprised, not only to be asked to loan their equipment to The Animals for an impromptu performance, but also to perform at the party that evening. This was their first official public performance and an unbelievable start to their long-term association with Club A’Gogo. 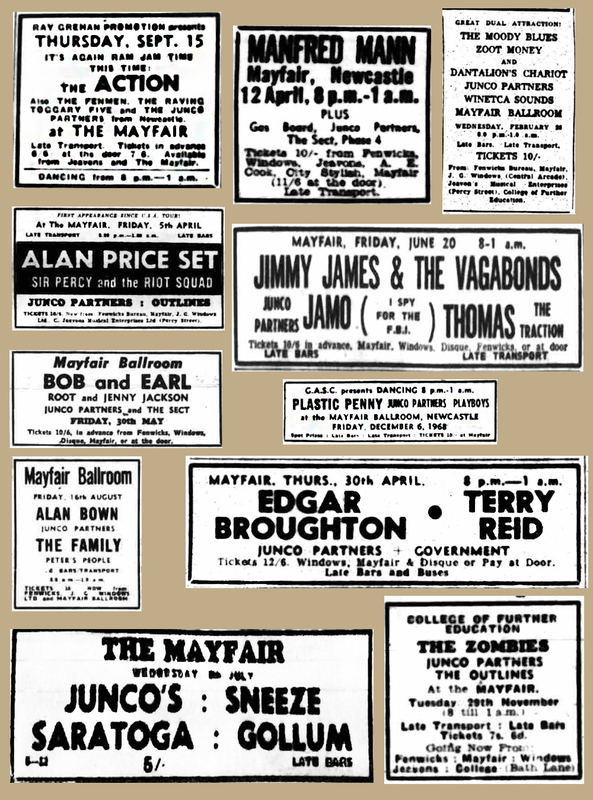 The Animals’ party led to the Juncos first advertised gig at the Club A’Gogo on 17th July 1964 followed by more gigs in August, September and October 1964. Mike Jeffery was keen to project the Junco Partners as a successor to The Animals and was advertising them in the local press as “from the same stable as The Animals” or as “another Newcastle find”. In November 1964 the Juncos gigs at the Gogo became a bit more frequent. It is widely reported that the Junco Partners took over from The Animals as the Club A’Gogo’s resident band. This is not strictly true. For a start, The Animals were never the resident band at the Gogo – at least not in that name. 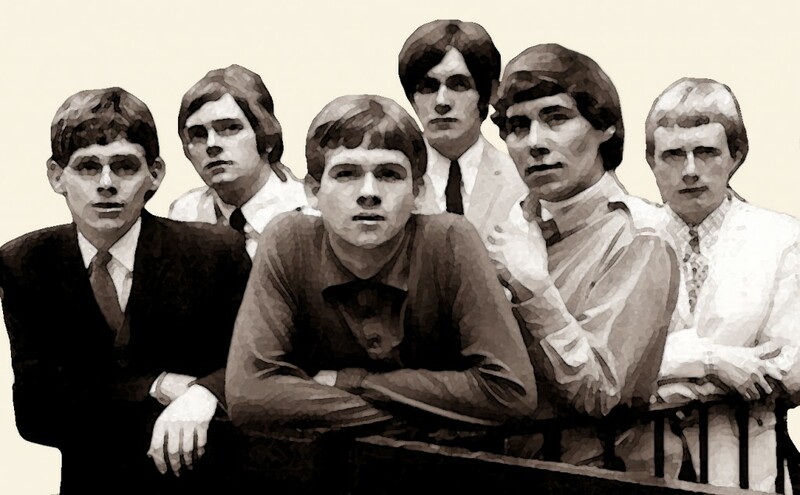 The band members from the first incarnation of The Animals; Eric Burdon, Alan Price, John Steele, Hilton Valentine and Chas Chandler had links with Mike Jeffery and the club from the time it first opened in July 1962. For the three months between September 1963 and November 1963 they performed at the Club A’Gogo virtually every night that it was open to the public (playing over fifty gigs) and became known as the club’s resident band. 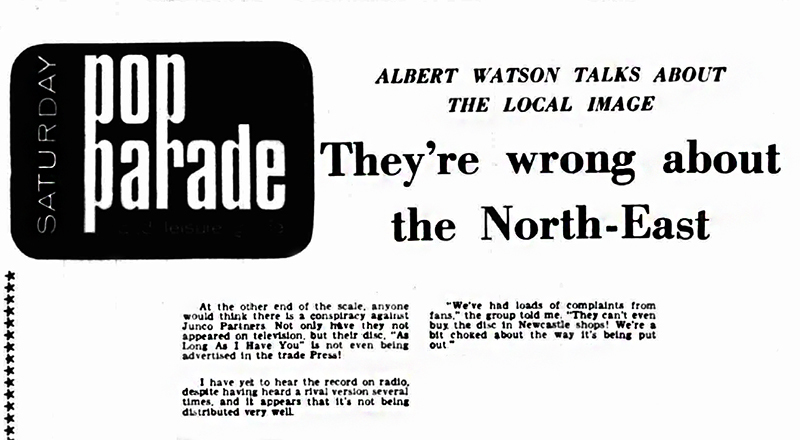 But their name wasn’t The Animals – it was the Alan Price Rhythm & Blues Combo. It was, of course, the same musicians who went on to become The Animals but during the period the band was considered to be resident at the Gogo they were the Alan Price Rhythm & Blues Combo. When the band’s name changed at the end of November they were whisked off to London to find fame and fortune. The Animals did return to the Gogo for a brief period around Christmas 1963 but only for a few gigs under their new name. 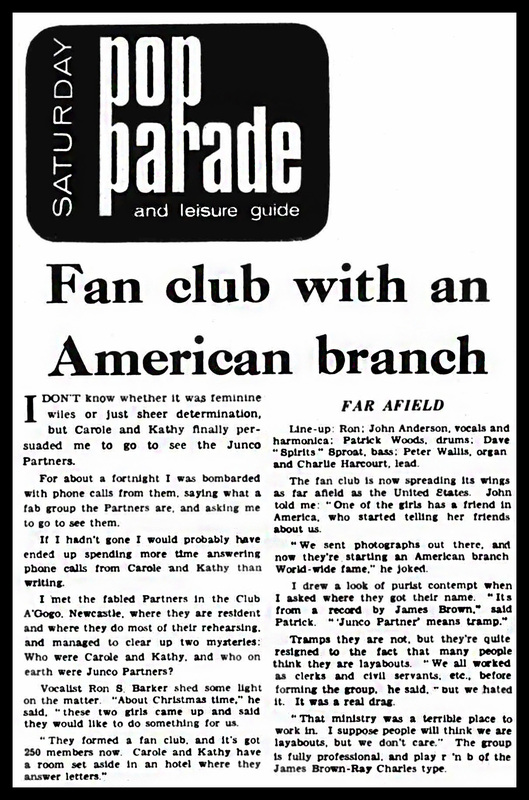 Towards the end of October 1964 the Junco Partners appearances at the Club A’Gogo stepped up to the extent that they were there performing nearly every night when the band didn’t have gigs elsewhere. This is probably the point when the the Juncos earned its status as the new resident band at the Club A’Gogo – ten months after the position was vacated by the Alan Price Rhythm & Blues Combo. 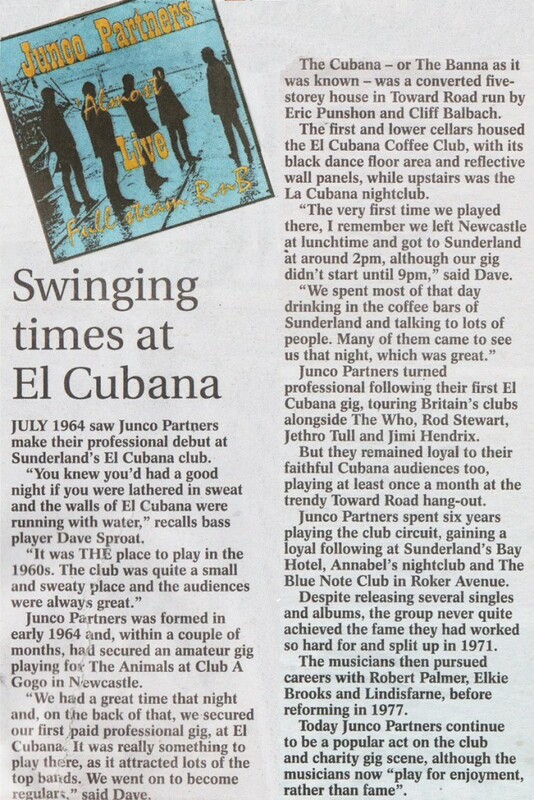 By this time the band members had turned professional and were in great demand throughout the northeast, in particular at the El Cubana club in Sunderland and the Victoria Hotel in Whitley Bay. Later they would establish themselves at the Bluenote Club in Sunderland, the Cellar at South Shields, the 45 Club in Whitley Bay and Newcastle’s Mayfair Ballroom. They also became popular in Yorkshire in towns and cities such as Sheffield, Leeds, Halifax and Bradford. In addition the band played a lot in the Teesside area at Redcar Jazz Club and Kirklevington Country Club. 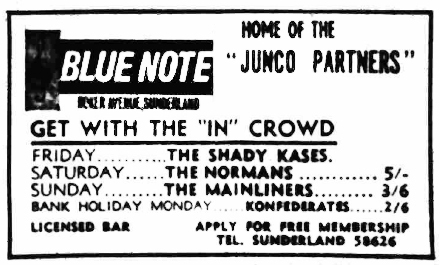 Due to their heavy gigging schedule outside of Newcastle it was inevitable that the Juncos could never hope to perform at the Club A’Gogo as frequently as the Alan Price Rhythm & Blue Combo did at the end of 1963. However, depending on their bookings elesewhere the band played at the club fairly frequently and in one period in the spring and summer of 1965 they had a regular Thursday night booking as well as a support spot for touring bands on a weekend. The band continued to appear regularly at the Gogo throughout 1966 and then fairly regularly in 1967 through to the clubs closure in 1968. The low chart position of the single was not high enough to bring the band to the attention of the nation and with no immediate follow up single, the Juncos had to rely on a busy touring schedule to raise their profile. 1966 saw the first change to the Junco’s line up. Keyboard player Peter Wallis was replaced by Bob Sargeant. During the following two years the two front men, Ronnie Barker and John Anderson left the band, handing over vocal duties to Charlie Harcourt and Bob Sargeant. In October 1969, as a four piece consisting of Charlie Harcourt (guitar), Bob Sargeant (Hammond), Dave Sproat (bass) and John Woods (drums), the Juncos toured as a backing band for the well known blues man – Howlin’ Wolf. The tour commenced with two gigs. The first was at the blues loft in High Wickham followed by a 2am spot at The Lyceum in London’s Strand for Brunel University, with both Fleetwood Mac and Deep Purple on the same bill. Both Gigs were amazing with Peter Green watching from the wings at the Lyceum. Howlin’ Wolf’s voice was so strong that it filled the 3,500 crowd Lyceum with only the help of the Juncos modest PA system. This became even more evident as Fleetwood Mac’s roadies removed their massive PA during the Juncos performance. The 21 day tour then continued crisscrossing the entire country as far apart as Southampton University to Cardiff University and Aberdeen Music Hall. Other memorable dates were the LSE, the London Marquee Club, The Bull at Richmond and the University of Lancaster where we were joined by Freddie King. Wolf ignored and completely upstaged Freddie King by crawling on stage on all fours clutching an empty bottle of bourbon as the band opened his set with the great riff from Killing Floor. The audience were treated to Howlin’ Wolf’s best ever performance as he asserted his authority over the young pretender Freddie King. Freddie later slipped on to the stage for a jam towards the end of the set but received no acknowledgement from Howlin’ Wolf who he should not have been let on stage. Wolf made a point of introducing the Junco Partners to the audience each night and as the Melody Maker review of the Marquee gig acknowledged “He seemed to enjoy working with them and they worked well with him”..
After recording an album “Junco Partners” in 1970, Charlie Harcourt left the band. Charlie was a tough act to follow. Efforts to replace him were unsuccessful so Bob Sargeant, Dave Sproat and John Woods carried on as a three piece before finally breaking up in July 1970. Their last advertised bookings in Newcastle were at the Mayfair Ballroom and Change Is. I left the north east in 1973 and in doing so, missed out on the rebirth of the Junco Partners in 1977. In fact, it was to be another 32 years before I saw the band again at the launch of the North East Beat Exhibition at Newcastle’s Discovery Museum in 2009. The only difference in personnel to when I had first seen the band in 1965 was that the organ had been replaced by a tenor saxophone and there was an additional guitarist. Instead of the mod gear sported by John Anderson in the sixties, he now wore the long mac which has become his trade mark in recent years. The band had re-formed in 1977 for the Newcastle Festival and after that began playing regularly at the Cooperage on the Newcastle Quayside. The revived Juncos included some members of the original line up plus Kenny Barker on guitar and Neil Perry on saxophone – (Neil left the band in 1999 for health reasons and was replaced by Justin Radford). An independent single achieved national release in 1978 and caught the attention of Malcolm Gerrie who had produced the television programs The Tube, its forerunner Alright Now and also White Room. A complete episode of Alright Now was made with the Juncos and Eric Burdon, former lead singer with the Animals, who was especially flown in from Los Angeles to jam live in the studio. A singles deal with Roxy Music’s management followed but chart success was still elusive. A cameo appearance as themselves on Jimmy Nail’s drama series Spender in 1993 reminded those of us who knew the band in the sixties just how good they still were. So although the Junco Partners never reached the same heights as The Animals, throughout their lifetime they continued to perform with the same enthusiasm and professionalism as they did back in the sixties. Perhaps the only thing missing from a maturing band was the youthful energy of the original Juncos. But that was replaced with a vintage quality that evolved with many years of stage experience and playing together as a band. Long may the legend of the Newcastle’s favourite band live on. Finally, here’s a great video of the band talking about their experiences with Howlin’ Wolf and performing Smokestack Lightning. Fantastic reading this, brought back many memories. I know many people mentioned. I was the original keyboard player in the Junco Partners when we formed during 1965. I left the band to join the Gamblers who were backing Billy Fury at that time. I am still involved in music and earn my living playing piano/keyboards and teaching where I now live in Tampa Florida. In 1966/7 the Juncos played regularly at the Vic in Whitley Bay. Me and my mate Rod Clements went to see them as many times as we could and marvelled at their power, authenticity and ability to play as a team. As drummer and bass player ourselves we were particularly impressed with the John Woods/Dave Sproat rhythm section. It was the Juncos who inspired us to keep searching till we found the right people to help us create the band we had been trying to put together. Eventually we found them and Lindisfarne was the result. Rod and I are part of a very small group of people who have had the opportunity to be replacement Junco Partners when one of the originals was indisposed, what a buzz that was. I remember Charlie Harcourt from the days when he and my brother Dale used to sit in our garage learning to play their guitars, Dale on the guitar he made in woodshop at John Marlay Technical School. Half the girls I went to Rutherford High School with drooled over Junco Partners, and we did everything we could to sneak out and go to Club A'Gogo. I left England in 69, but I still remember the "Old Newcastle". Last time I was back there, around 20 years ago, I hardly recognised the place. Ray ... I was lucky enough to find a Lindisfarne CD here in Canada about 4 years ago. Nearly fell over when I saw it! I remember the Juncos well, as Charlie worked at the same company as I did (Joyce Loebl). We used to talk a lot, since I had a band (Jesters) but it turned out Juncos were much better! I still try to follow whats going on - even though it's 45 years later and I left the UK in 69 for the US. I plunk around on my Telecaster, here in Atlanta, while thinking of the old Geordie band-scene! Cheers! I came across this while doing a search on something for work, what a great article, John Anderson is my uncle (in fact we are close enough to be brothers!) I live in the midlands and have never seen the juncos live, but remember them arriving at my parents house while gigging and crashing out in our living room. I was looking around the internet to see if I could find anything relating to the Junco Partners as Peter Wallis is my uncle that I have not see for year was good to see him write a comment on this and only this year. I can remember the song about the hammer. Pity the Cotswolds are so far away! After shuffling around the North East with various bands,I got the job replacing Pete on keyboards as the apprentice (sorry Dave). First gig at the Bay hotel Whitburn(?) was a bit scary - knowing the Juncos fine reputation - but no problem. They were exciting and a joy to play with. No finer rhythm section! For four years we had some extreme highs and a few lows but I couldn't have wished for a better start to a musical career. The Howlin' Wolf tour was incredible, playing to sold out audiences every night for four weeks. Reluctantly,I left in 1970 and moved South to play with Mick Abrahams, Andy Roberts and later into record production - producing John Peel sessions for Radio 1. Couldn't have done this without my Juncos years! Many fond memories! Unforgettable times. Love em! The Cooperage 78-81, The Juncos, the Sabrejets and the 45s. We were so lucky. Tall Windows / Noizez in my Head. Energy Record Co 1981, great record. anybody got a contact for Neil Perry please. Illness .the stories I could tell ! Maybe I'll do it one day.Thanks lads. Played with Charlie in the 80's wonderful guitarist, beautiful person. Happy days fond memories, now in the states, shame the Hammond is so heavy!! WOW This brings it all back. the JUNCO PARTNERS @ Stanley youth centre circa 1966- 1968. Full House. from the Bob Sergeant days. Happy 60's. 11. Bring it on Home. 2014 will be the Junco Partners' 50th anniversary & there should be some form of commemoration/fitting tribute to these Geordie Heroes. I'd love to see a DVD of a live gig or even edited footage of the band in action. There must be many afficionados who feel the same way, hopefully enough to bring this to fruition. A tremendous band! I started seeing them about 1978/79 when they used to play at the Golden Eagle in Blyth, which led me to their regular Wednesday night slot at the Cooperage. Somewhere knocking about I have a tape recording of a gig at The Golden Eagle from 1979 - I hope I can find it! P.S. I did ask first! Come and see The Junco Partners at Gosforth Empire Club on Friday 22nd May,really looking forward to it. I don't know if I'm imagining this or my memory is playing tricks but I'm sure that I watched the Junco Partners play at Thornhill Comprehensive School in Sunderland where I was a pupil sometime in the late sixties at the school dance. I don't know whether someone could enlighten me on this! I was lucky to be at Newcastle University between 1978-79. Great Wednesday night sessions at the Cooperage on the Quayside. At the time they were has good as the E Street Band. Many thanks for some great nights out. I attended The John Marlay School and knew Charlie Harcourt. In 1963 we went to see the Beatles at Newcastle City Hall. What was memorable (apart from the Music) was our seats which were on the organ/choir steps at the back of the stage where the artists performed. So we saw the beatles but mostly their backsides! The phantom and (very) occasional sax player with the junkos was Gowan Turnbull. Mate of neil perry. Now living in France and scoring french films. What great memories from the cooperage! Possibly my closest brush with a proper music legend came when Howlin' Wolf was sitting on a bar stool at Annabels waiting to Headline, and nobody noticed him it seemed. He allowed to buy him a drink, signed an autograph, (not much more than an "X"), and chatted happily for 10 minutes. Goodness me we got so many undeniable legends in Sunderland, didn't we. Ike and Tina seemed to be on every other month, Alex Harvey the same at Cubana, Rod the mod and the brilliant Beryl Marsden with Shotgun Express at the Tech, which also hosted for my money the best female British singer ever - Sandy Denny and Fairport Convention. Those definitely were the days. I've still got the 'Junco Partners' album (on the Phillips label). Crackly as hell, but still plays! Well I think my blast from the past is of a young Ronnie Barker. if I am right he worked at the Ministry in Longbenton. He told me he was leaving to go to Hamburg with a band. I think he mentioned The Junco Partners.